I am using no power tools on this knife. I am doing it for myself with nothing but hand tools. You will have to wait until I am done for pictures... don't want to jinx it. Interesting how may gun hunters also make their own knives. I wasn't ambushed and held captive by the local natives, if that's what you're thinking. Well then maybe you was kid-napped and held captive by some wild women... and if that's the case what the heck are you doing back here??? Darn D_Hoff, I didn't think anyone was going to guess. I finally chewed through the ropes and got away. And, Bushy thought I was having a gun battle with the cartel! I picked up a SwingBlade last fall, and I'm glad I did. The gutting blade works even better than a gut hook. This is a high-quality knife, well balanced and easy to grip. I field dressed my deer in the snow at 12 degrees F in a 25 MPH wind. I am very glad to have been able to make such short work of the job - it was just too cold to waste any time. The blades are super sharp, and hold an edge well. The sheath holds the knife very securely - no chance of losing this one. I'll stay loyal to my Kershaw - it stays sharp & fits my hand. Welcome aboard Marty...grab a beer and pull up a stump mate. That knife is an interesting concept mate. Do the blades lock in position? Do you find that they move when you are working? As HunterJoe says...a very sharp blade very nearby. Still and all, it looks like a very good knife. The button is recessed into the handle enough to prevent accidentally changing blades. 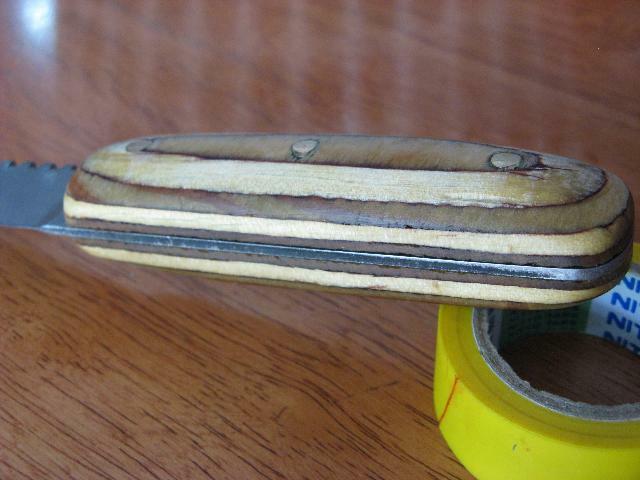 Also, the safe edge of the unused blade is flush with the handle. Gripping the handle in use also would prevent the blade from swinging unintentionally. If you want a totally safe blade that couldn't possibly cut you, I suggest the "safety knife" on the YankeeArtifacts.com website. Pretty funny stuff. Well....I have decided to try a different tack with this last knife I put together. 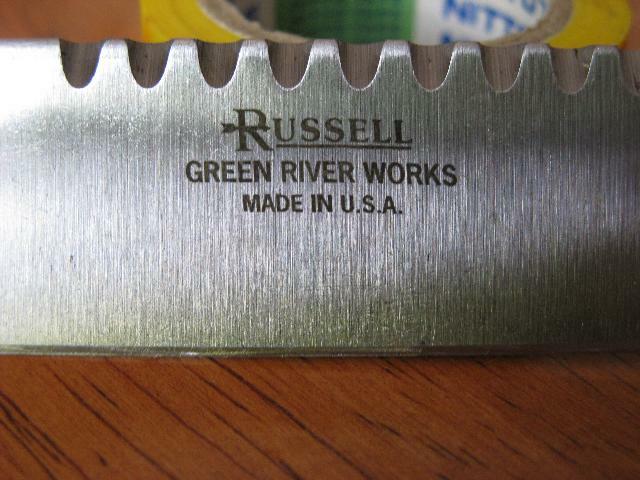 I acquired a couple of blanks from RUSSELL Green River Works via Fleabay...nice and cheap too. The handles scales are made from cheap and nasty 5 ply plywood...a bit of careful shaping, sanding smooth them hand rubbing about 6 coats of Linseed Oil into them made them look purty reasonable...much to my surprise. This is my next "project". Have a nice piece of reddish hardwood (Turpentine) from which to make the handles scales. Only thing I am a bit iffy about is the blade thickness...only 2mm...but they seem fairly strong, and take a real nice edge. What do you guys use for rivets? Make your own or do you buy them? Suz, you can use anything that doesn't rust: stainless steel, brass, red cupper, aluminium... be it tube or solid, it all works fine. And of course you can buy special srews and mozaik pins or anything you like and does the job (don't forget a suitable drill!). You even can use hidden pins or make your own mozaik pins. And don't forget to use an epoxyglue to fix everything permanent together. @Vince: looking great but I like your "file" more. Are you now into throwing knives? 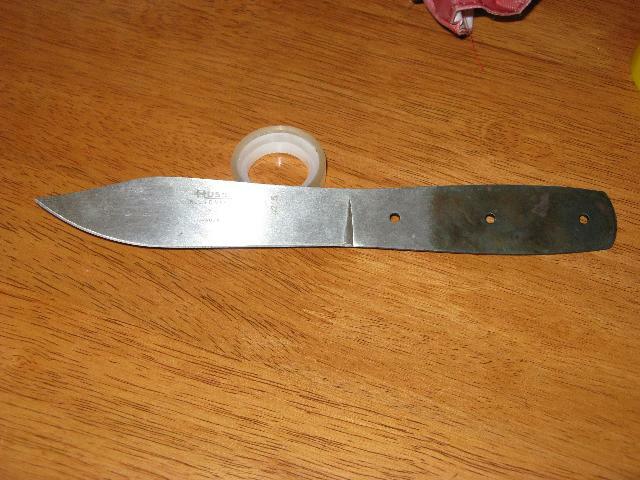 when I was a young boy 16 years old, I was so rough on knifes, they kept breaking. I found a knife that suited my needs and have survived all my hunting, fishing and throwing experiences. I still use this exact same knife today, its still razor sharp and I have used it for every thing skinning, cutting up meat, and chopping wood. I do not have a picture of the one I have, but found a picture of it online, and it is exactly what it looked like when I first bought it. 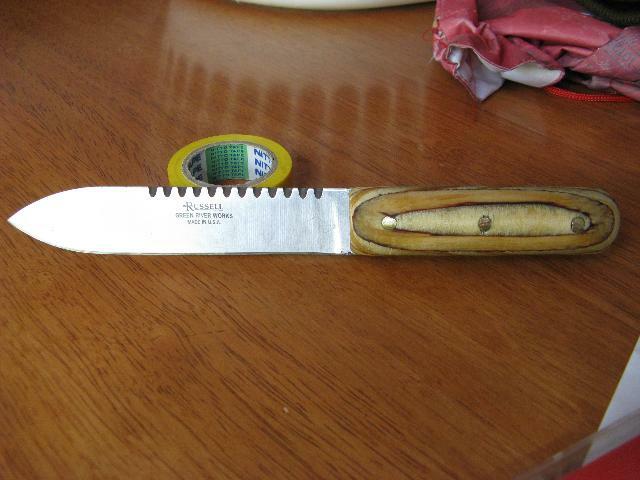 I need to re-wrap the handle with another snake skin, after 17years the one I had on it has worn off. 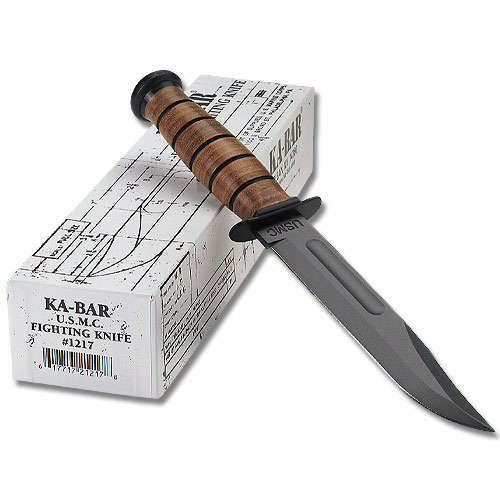 the one and only knife that I have found worth while and that holds up to brutal abuse is the USMC Ka-bar Knife. I buy brass rod Suz. It comes in various sizes and you simply cut to length. As Aloysius says...there are many and varied ways of securing the handles to a knife...a trip to your local Nuts and Bolts store will offer quite a few different options. No Aloysius...not into throwing knives mate...that is the two different styles of blank that was on Fleabay. Have another 3 "file" knives in the works...one is in the rough shape stage...the other two still look like files...they just haven't found themselves yet.